It’s about time that they sent out honest pleas for money. Image by Jungleman and found via HumaneWatch. 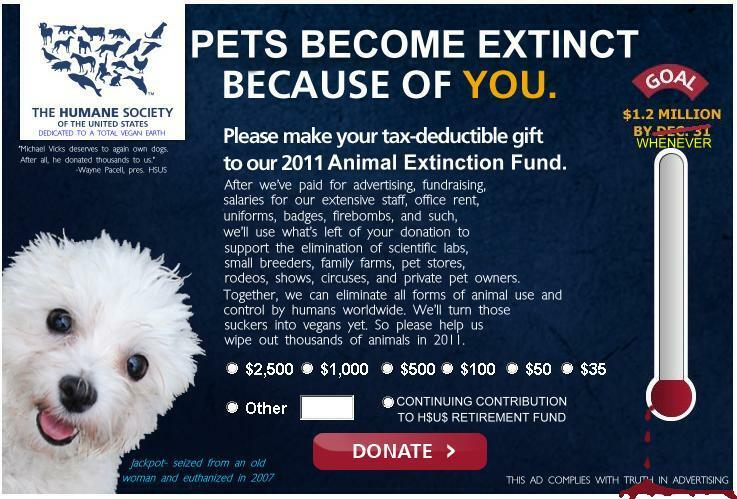 Extinction is a biological and evolutionary process/event … and methinks the HSUS has no freaking idea what extinction is. Our domesticated pets are under no threat whatsoever of extinction. It’s a parody fundraiser, hence the extreme language. HSUS, while using the name of local humane shelters, actually opposes all “use” of animals, including pets. They also don’t support actual shelters. Just like PETA really kills pets instead of lending any sort of support to no-kill shelters. Oh. Damn … it’s hard to tell what is parody, and what is the real stuff! HSUS’s #1 goal is to stop sport hunting, and somehow you equate this with the desire to make pets extinct. Astounding logical reasoning skills you display, good sir! Have you been to cities outside of the western world? In Delhi, India, packs of wild dogs roam the streets at night, making it unsafe for children to go outside alone. 100 years ago in this country, feral pets were much more of a nuisance than they are today. HSUS is also very interested in stopping fur coats and industrial dog breeding. I’m mixed on the coats, myself, although that might be because my grandfather was a professional furrier and my father was in the business for a while, but there’s really little defense for modern dog breeding practices. It’s all done so that the dogs look a particular way. That’s why, for one example, all German Shepards are lame (an in-bred genetic trait causes problems in their hips). That’s a pretty sick practice. People should by non-AKC breeds like Jack Russel terriers. HSUS does nothing but politics. They do not run a single shelter. Give money to a local shelter if you really want to help animals. They run ads for shelter adoption and spay/neuter. They run the main shelter trade magazine. They accredit shelters. They train shelter workers. I’m sure there is a “wrong” in there somewhere, but I’m just a fly-by-night guest here. Dog gone it! When I saw the words “HSUS Final Fundraising Push” I got my hopes up that it was a going out of business sale or something. Joshua, You don’t think accreditation is politics? “Do it our way and give us money or we won’t approve of you”..?